Hoping to make a fast buck from those looking for a quick fix to their weight woes, peddlers are touting slimming pills online illegally. Some sell weight-loss pills prescribed by their doctors for a tidy profit. Others hawk natural supplements that contain toxic ingredients. One peddler made a profit of close to $18,000 in six months from selling pills that were marketed as "100 per cent natural", but contained a banned ingredient that increases the risk of a heart attack. 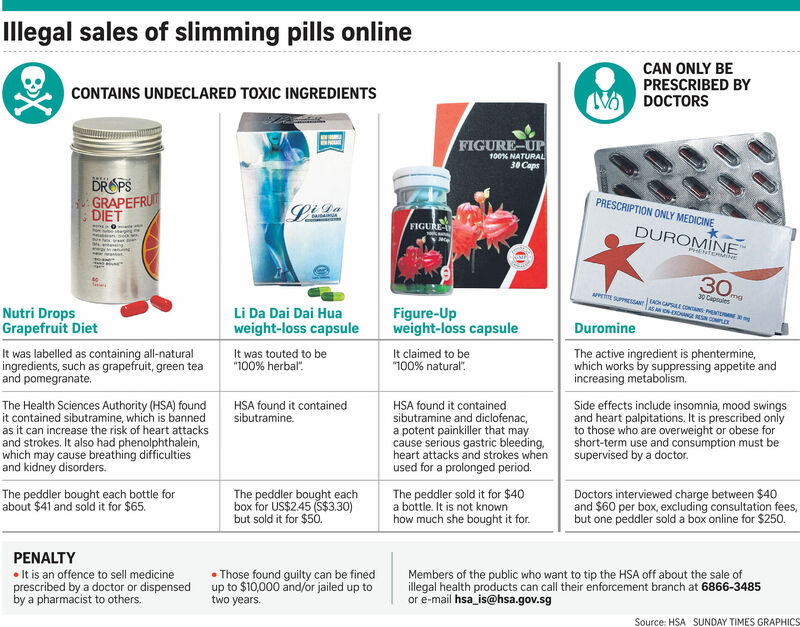 The Health Sciences Authority (HSA), which regulates health products, has prosecuted seven women, including an engineer, for selling slimming pills illegally in the past two years. They sold their products through social media, discussion forums and other websites. The latest case involved an unemployed 27-year-old woman who was fined $8,000 on June 27 . She sold Li Da Dai Dai Hua weight-loss capsules for $50 a box, having bought them for US$2.45 (S$3.30) from overseas. The pills were touted to be 100 per cent herbal, but HSA's tests found they contained undeclared ingredients such as sibutramine, which is banned as it can increase the risk of heart attacks and strokes. Slimming pills made the news recently after a 22-year-old student in Singapore, who was in the healthy weight range, died from an overdose of such pills. On May 31, the Coroner's Court heard how Ms Huang Guo had almost 10 different drugs for weight loss and for countering the side effects of these pills. She had ordered them from the websites of a clinic and a hospital in Thailand. Her blood was found to have about eight times the therapeutic limit for phentermine, the active ingredient in appetite suppressant Duromine. Of those caught by the HSA, two women sold Duromine, a popular weight-loss drug that only doctors can prescribe here. A 21-year-old unemployed woman obtained Duromine from a clinic and advertised it online for $180 a box. But she raised the price to $250 when she found buyers were willing to fork out extra. She was fined $3,000 last December. Another peddler, a 33-year-old engineer, obtained Duromine from a clinic for $45 a box for her own use. She then sold it at $95 a box. She was also convicted last December and fined $3,000. It is an offence to sell medicine prescribed by a doctor or dispensed by a pharmacist to others, and offenders can be fined up to $10,000 and/or jailed up to two years. Doctors say they charge between $40 and $60 for a box of Duromine with 30 capsules, excluding consultation fees. General practitioners interviewed charge between $20 and $30 on average for consultations during office hours. On a popular online forum, there were at least 20 people in the past year selling Duromine, and for as much as $150 per box, checks by The Sunday Times found. Dr Tan Kok Kuan, of Dr Tan & Partners, said: "Duromine is very effective and it works very fast, and that is why it is so popular." But it can be addictive and its side effects include insomnia, mood swings and heart palpitations. Under the Singapore health authorities' guidelines, doctors are advised to prescribe it only to patients who are obese with a body mass index (BMI) of 30 or higher, or to those who are overweight with a BMI of 27.5 or higher and suffer from diabetes or other obesity-related conditions. Doctors say they prescribe Duromine for up to six months and its consumption must be supervised by a doctor. In 2009, the Health Ministry warned doctors to be more stringent in prescribing slimming drugs to patients who may not need them. This came after the International Narcotics Control Board listed Singapore as among the countries with the highest consumption of phentermine worldwide. Some who are slim also try to get Duromine from doctors . They want to look good for their wedding or are seeking to shed the extra weight gained after a holiday, doctors interviewed say. Most who ask their doctors for weight-loss pills are women, from teenagers to those in middle age. Dr Daniel Wai, of Daniel Wai Diabetes, Thyroid and Hormone Clinic, said: "Some who ask for the drug are not overweight but they think they are fat, because they are not as skinny as Fann Wong or other actresses and models." So these women may turn to online peddlers if they cannot get the pill from their doctors, he said. An HSA spokesman advised the public not to buy health products from unknown websites or people posting offers on online forums or blogs. Among other dangers, the product could be fake or adulterated with undeclared ingredients that are harmful.